As I’ve written before, borrowing from the phrase coined by the peerless David Allen Lewis, media figures who hate Israel never rest. They never take a day off. They eat lunch at their desks. They run on minimal sleep, driven by a desire to rid the world of Israel. These “Media-ites” as David so aptly described them, are infused with the same feverish hatred for Jews that the Israelites’ ancient enemies suffered from. The long media campaign against the Jews is truly unique in world history. From the campaigns of Haman to demonize the Jews, to Hitler, and now modern/archaic Muslim terrorists, anti-semitism is a malignant evil. And these savage attacks come from all sources, all across the globe. 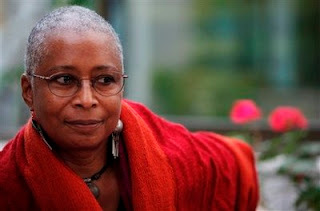 In April, the author Alice Walker (The Color Purple) used a book tour as an opportunity to bash Israel, describing her travels to “Israel/Palestine” and framing them in the context of a supposed link between Israel’s “treatment” of the Palestinians and the suffering of American blacks during the Civil Rights era. The equating of Israel with Germany is of course insane, but it has also proven to be effective. It represents the confusing world of disinformation and misinformation. Walker knows that equating Jews with Nazis is absurd, but she also knows listeners begin to believe it. For the record, the Germans she is referring to rounded up, imprisoned, and murdered millions of people. Israel of course has never done any such thing. In the Middle East itself, Hezollah and Hamas are busy whipping-up the Arabs into a frenzy, via satellite television. Al-Aqsa TV is a prime asset of Hamas. Originally broadcast in January, 2006, after the terror group won power in elections in Gaza, the programs are broadcast from Arabsat and AtlanticBird satellites, and can also be seen on Egypt’s Nilesat. These broadcasts also reach into central and western Europe, and Al-Manar (Hezbollah) television programs are seen in Asia and Australia. All these programs glorify the annihilation of Israel, and they promote the Iranian-style Shi’ite Islam. It is clear that there is an extremely eclectic, determined, and diabolical coalition that is attacking Israel 24/7 through media. Celebrated western personalities and radical Middle East Muslims, in this context, are linking arms in a drive to push Israel into the landfill of world history. As we move through this particular moment in history, in order to reach as many as possible, it is critical that we educate ourselves and inform others. Recently, I’ve received a good number of emails from pro Israel Christians who are frustrated because they feel they are limited in what they can do. Listen…wherever you are, whether limited or not, it is important that you support Israel by correcting wrong and damaging information about the Jewish state. Benjamin Netanyahu has called it a battle for truth, and indeed it is.